The prevailing theme at the Consumer Electronics Show is usually TVs, but everywhere we look this year there’s a much smaller screen staring back. CES 2011 has kicked off the ‘year of the tablets’. 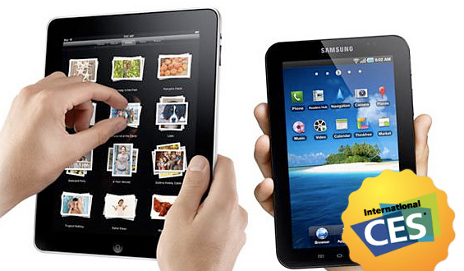 Rumours suggest that there’s going to be in excess of 100 tablet PCs on show at CES 2011 in Las Vegas. There won’t be anywhere near that number of tellies. And there’s a big difference between tellies and tablets, apart from their size and function, everyone owns at least one TV, while tablets are very much in their infancy. So how many of these tablets will actually succeed? It seems like every two-bit manufacturer is rushing them to market, but have their respective CEOs really done their homework? A year ago Apple launched the iPad, which was then followed by a smattering of big-name models – such as the Samsung Galaxy Tab. Now the market’s starting to get flooded by them – can they all survive in the dog-eat-dog world of technology? Many of the tablets at the show will be very poor, but we’ve actually seen some pretty innovative ones – take the recently announced Asus series of Eee Pads with slide out keyboards and HD video. There are also some exciting, but as yet, unconfirmed models. The Motorola Droid Xoom running Windows 8, the HP PalmPad and whatever LG has up its sleeve. How many tablets will succeed? I’m lucky enough to be reporting directly from CES and we’ll have our work cut out in bypassing the no-name tablets for the big brands – though I’m not even convinced that these latter models will fare so well. Tablets are, after all, new technology that’s unlikely to saturate our homes anytime soon. And many prudent shoppers will be holding out for the imminent release of the Apple iPad 2, which is expected to be announced later this month. I find the whole tablet race very intriguing, and the predictable frontrunners are starting to stretch their leads, but who knows which will make it to the finish line. Keep an eye on our CES 2011 tablet page for news and videos as new models are announced. I’ve had a play with the iPad and think it’s a great additional gadget to have around the house, but I’m put off buying one because the lack of keyboard means you’ll always need a dedicated computer. I like the look of the LeNovo IdeaPad – where you can release the screen from its netbook casing to act as a tablet – but is it the best of both worlds or too good to be true? With Apple so far ahead of its competitors in terms of timings I do wonder whether everyone else has missed the boat. As Ben points out tablets aren’t going to be for everyone – the question is has everyone who does want one already bought an iPad….